Sifu Jack Soderberg founder of the CDF academies demonstrates tai chi form at a demo in chicago. 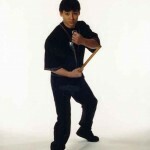 Sifu Jack has been training martial arts for over 30 years. His school is located in Las Vegas, NV. With all the respect for Sifu Jack, this should not be called Tai Chi. The first form is part of the first the first half of the Liu he ba fa as taught by Master Wai Lun Choi. You are correct and Jack was a student of Mater Choi in Chicago.